Pray along with the audio Chaplet on your favorite device! Available on Spotify, Amazon Music, Apple Music, Google Play Music, iTunes, CDBaby, iHeartRadio, and more. 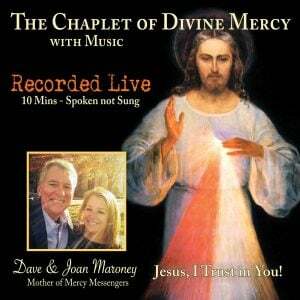 Search for “Chaplet of Mercy with Music by Dave & Joan Maroney”. Pray the Chaplet of Mercy on Spotify! Spotify is a music streaming service that you pay for. Click this button only if you have a Spotify account. To download the Chaplet of Divine Mercy click on the download link at the top of this page. All along the way they have taught and prayed the Chaplet of Mercy as presented in this live recording. This prayer was given by Jesus in 1935 to a young Polish nun, now Saint Maria Faustina Kowalska, as documented in her Diary, “Divine Mercy in My Soul,” passages 474-476. The Lord made it clear that this prayer would be a source of great grace and blessings for our world, a world immersed in suffering and darkness, a world in need of atonement for its sins, a world in need of mercy. Background music “Psalm 22” by Reverend James L. McKearney, P.S.S., S.T.D., used and shared with permission. Mp3 download: go to soundcloud.com, search “Psalm 22 Chaplet Background”. The Diary of Saint Maria Faustina Kowalska, “Divine Mercy in My Soul,” copyright Marian Fathers of the Immaculate Conception, Stockbridge, MA, all rights reserved, www.marian.org. Visit the Marian Fathers excellent website thedivinemercy.org to learn more. Recorded, mixed, and mastered by Dave Maroney, 10 min and not a second more. Copyright Dave & Joan Maroney, permission granted to download, make copies, share, use in YouTube videos, and use in a private or public setting where no admission fee is collected. Click the Download button at the top of this page for the mp3 download. Find this track on soundcloud.com, search for “Chaplet of Mercy with Music”.